Hi all! My last questions was answered so fast and was so helpful I just had to ask another... I recently had my tub reglazed. One of the reasons for doing so was a small amunt of worn/rust that was on one side of the drain. I replaced the flange and have found that it does not seem to go quite as far down as the old one (which I have already discarded). 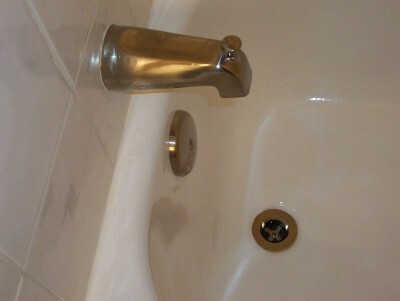 It seems to hit the side of the tub, thus preventing it from going further down. The result is a VERY small amount of water that seems to pool up. In fact, it probably did the same with the old one, which is what caused the rust (after 30 years). However, this new flange must be a bit wider because it definitely covers more of the around around the drain. It's 2 3/4 " wide. Could the older one have been smaller in width? Are smaller ones till around? 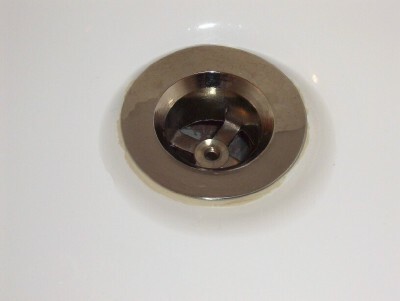 The flange sits horizontal on the tub bottom and screwed in with a fair amount of effort, which would eliminate the change that I crossed the threads. Had I done that, I'm sure it would have been a bigger battle screwing it in. I used plumbers putty. It doesn't look bad, but if a smaller flange is available I'd use it. Thanks. Last edited by speedball1; Nov 18, 2008 at 12:55 PM. Different manufacturers make drains slightly differently. They may all fit the hole but may sit different. No brand I know is smaller than the others, you have to eyeball several at a large supply house. You may not see a big enough variety at Home Depot so try a plumbers supply shop. Buy cheap, new overflow assembly. Don't get the "Touch Down" overflow. It has thick flange. Remove the cheap flange and install it. You can discard rest of the drain in the box. Use tool specifically made for this installation so you don't strip the ribs on the inside and also so you are able to screw it in as much as you need. 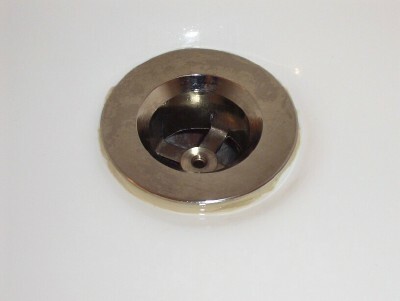 The cheap flange will cave in a bit and will copy contour of the drain inlet. I don't see the image you are referring to. However, it is the typical wrench that I used to remove the old one and install the new one, I know what it is is. It's a kind of tube-like thing that goes into the drain and between the "cross hairs"? A cheap one that will contour makes sense. I now have 3 options: leave it, find a supllier that has a slightly smaller one, or get a flexible one. THANK YOU BOTH! 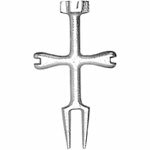 I am sure this is the wrench that Milo and Tom is referring to, Good Luck. So far I've struck out finding a flange that is a bit smaller in diameter than 2 3/4". On a local plumbers advice, I called an area supplier. The plumber said that if anyone would have it, they would. Well, they had nothing and new of nothing. He said that years ago some flanges were a bit smaller, but he had no suggestions on finding one. I'll see if I can find one like Milo described. I'll also keep on surfin'. I did some measuring. The plumbers putty is slightly less than 1/8" on the inside, and of course it tapers to nothing on the wall side. An eighth of an inich doesn't seem like much, but I'm curious... Do you think I'm better off using caulk? You guys are awesome. Thanks. Runner, any chance you can post a picture for us? Every time a new post is attached to this one Milo, Tom, John and I are all notified so someone will be here. Here's a few photos. One is of the drain with the ring of water around it, another when it is dry. At its highest, the flange sits up slightly less than 1/8". Thanks again. You have "Touch Down" drain. Yes, most of them are thicker but there are few manufacturers who make them thinner. You have to look for them. If HD or Lowe's don't have them, than go to smaller, local, stores. Other wise, you will have to replace entire overflow assembly. Thanks. I'm not sure I like the sound of replacing the assembly. However, the wall next to it is a closet. Can a good plumber get to it if there is wall access? Runner, thanks for the pics, never seen one with this much thickness to it. We call this type of drain a toe touch. I see no solution to your issue off the top of my flat head. I'd have to replace if it were me. The close-up photo is a bit misleading and makes it look a lot more than 1/8". I still haven't been able to find a supllier with a smaller one. None of you said that 1/8" of plumbers putty is a good idea, so I guess I'll call a plumber to come in and adjust the assembly to get it to line up better. I hope he/she can get at it from the adjoining closet. The garage wall is below it. Any thoughts? Thanks all. I serouusly doubt that this can be made better. I'd let the plumber install a new drain and tear into the garage wall. Looks like you could tighten the strainer until all of the putty squeezes out. The strainer isn't centered on the opening. Tightening it will center it. (unless the reglaze is very poorly done, or the strainer is cross threaded making it near impossible to tighten any further. This just doesn't look like a flange problem to me, It looks like an install problem. There should be no visible putty once the flange is tightened down suffficiently.